Last night we lost our sweet Memphis to bloat, a condition not uncommon in larger breed dogs in which their stomach becomes twisted. We took her to the vet emerg in Oakville and they performed surgery, but there was already irreversible damage done and we were advised she would not be able to recover. 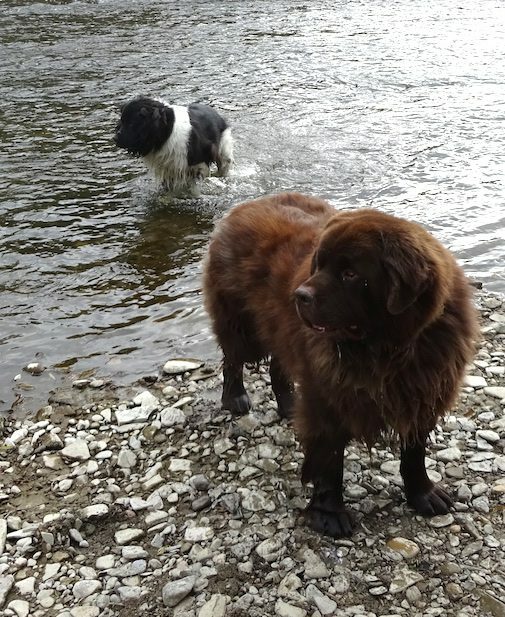 Memphis, who was a Landseer Newfoundland, was a wonderful companion. She loved car rides, wandering through forests while I looked for mushrooms, and especially swimming. She was our pal and a member of our family and we loved her dearly. She was just short of 8 years old. Here are a few pictures of Memphis over the years. Those are all beautiful pictures of sweet Memphis and I know you have many more, as I have always enjoyed watching her adventures over the years. Indeed those of all your fine animal family. She always seemed to me the mom of the group. I am so sorry for her passing and I wish you all sweet memories of a wonderful dog. Thanks Barb. In a way she was the mom of the group. For sure she managed the cats! She loved car rides and mushroom foraging and pizza, not necessarily in that order. Eugene, I am so so sorry to read this. I only know you and your critter family online, but it shocked and saddened me. Our animal souls are so precious; they teach us how to be happy, uncritical, loving, simple, when those are such hard things to be sometimes. It’s the Thanksgiving holiday here in the US and reminds me to be extra thankful for all the beasts that have shared my life. blessings. Thanks Sled. She brought us a lot of joy.